On the evening of May 24 and again on the evening of May 25 I heard and was able to identify by hearing one, and possibly two, Buff-collared Nightjars (ABA Code 3) at the base of the entrance to Madera Canyon near dispersed campsite number 1. From 7:45 until at least 8:00 p.m. the bird(s) called repeatedly from the hillside just south of Proctor Road. I was not able to see the bird, or at least if I did see it briefly in low-flight, I was unable to identify it other than by song. The song, however, is unique and distinctive and I will add it to my North American Life List as number 728. It joins the Black Rail as one of my two “heard only” birds. Close enough. Early in the morning of May 25 I was on the Anza Trail near Tubac in a second effort to locate the Sinaloa Wren (currently an ABA Code 5, but I am betting it moves to Code 4 based on the frequency with which it is being seen in the past two years) that had been seen there throughout much of the spring, but had not been reported in recent days. My patience sitting for about 2 hours on a fallen tree trunk near the power line cut on the trail was ultimately rewarded by a fabulous view of the wren as it fluttered up from the underbrush within a few feet of me in pursuit of a small moth or butterfly. Although there is a possibility that the bird I saw was a Bewick’s wren, I am satisfied that it was the Sinaloa Wren because of the brightness of the brown coloration and the eye-stripe, both of which appeared to me to be more extensive than what I have seen on Bewick’s Wrens (of the southwest eremophilus race, or subspecies), and finally, of course, the location. There was no “tail-wagging” behavior. The bird was silent so I did not have the advantage of that in making my identification. I am certain enough to include it as 729 on my Life List. Later that week I went to Washington State for several purposes, one of which was to try to find a Sooty Grouse. If seen, this would reduce my unseen ABA Code 4s to 7, but in spite of hours spent on and near Hurricane Ridge in the Olympics, I neither heard nor saw a Sooty Grouse. This bird is becoming my number 1 nemesis bird. If anyone reading this blog knows where I can find them, let me know. If it seems from this report that I must get bored spending so much time not finding the birds I am looking for, that would be far from the truth. It is pure pleasure to spend hours in pristine areas enjoying the sights, sounds and feelings of the natural world. That alone is sufficient reward for the effort involved. A welcome bonus is the occasional exchange of greetings and thoughts with folks, such as Carol on the Anza trail, who share my love of nature. I did some homework on my ABA list of North American Birds soon after I tallied number 725. I found that I have seen all of the approximately 490 Code 1 birds, and all but 10 of the approximately 165 ABA Code 2 birds. The next challenge was not long in forming in my brain: top priority for me in 2014 is to see the remaining Code 2 birds, namely, Mottled Petrel, Sooty Grouse, Purple Swamphen, Scripps’s Murrelet, Whiskered Auklet, Mangrove Cuckoo, Black Swift, Bluethroat, McKay’s Bunting and Nutmeg Mannakin. The only place to find Purple Swamphens and Mangrove Cuckoos is Florida, and the best time for the Cuckoo, is springtime. I decided to make them my first targets. I contacted Chris Newton, an accomplished Florida birder and photographer, to see if he would like to join me to help me find them. He readily agreed, and with his invaluable help, we located both of my target birds. The photos included in this blog were taken by Chris and are used with his permission. I flew into Orlando and picked Chris up at his home in Kissimee and we drove to Green Cay Wetlands and Nature Center near Palm Beach. What a fine place this is. The wetlands are quite extensive and are unusually accessible by virtue of the impressively long board walk that has been constructed throughout. We searched a long time before finally locating a Purple Swamphen hiding in the tall grass. A few looks at its head were quite unsatisfactory, but after a while, though at a distance, the bird decided to fly to another area, Chris was able to photograph it, and I was able to follow its flight in my bins as it flew over the open water. The legs were not as red as I expected, so it was probably a youngster. 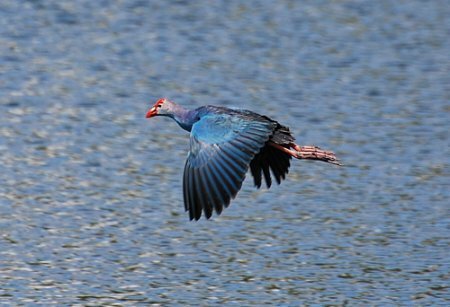 The next day we saw an adult Purple Swamphen flying across some water. Among the interesting sights along the boardwalk was that of a Black-necked Stilt guarding its clearly exposed nest with 4 brownish eggs, vigorously harassing an approaching and hugely larger Great Egret. She (or he) was joined by several other Stilts as they successfully diverted the Egret from the nest. Life is perilous in the swamp. A few Alligators glided through the open water. 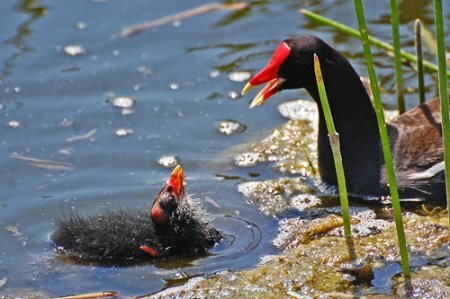 Common Gallinules were common, and many of them had chicks. A young Least Bittern clung to the reeds and seemed oblivious of our presence on the nearby boardwalk. Target number 1 was in the bag so we decided to get a jump on tomorrow’s effort to find a Mangrove Cuckoo. We drove on south toward and past Miami and explored 2 or 3 likely sites, with no success. As darkness descended, we decided to call it a day, seek shelter and sustenance, and get an early start in the morning. That we did, and by 7:00 a.m. the next morning we were searching the area around Black Point Marina near Miami. 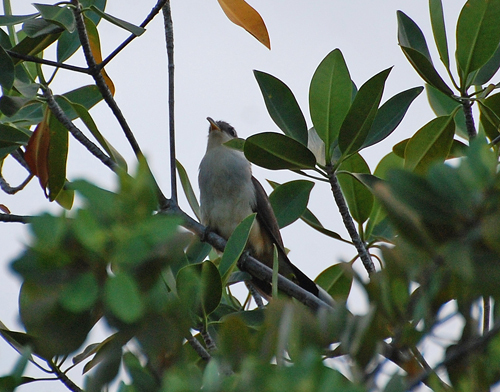 We did not have to wait long before a very vocal Mangrove Cuckoo made its appearance and was most cooperative in selecting resting sites that allowed for decent photography. Having notched numbers 726 and 727 in my North American Life List, we began the long trek back to Kissimee and Orlando, stopping at a few bird-friendly locations on the way. 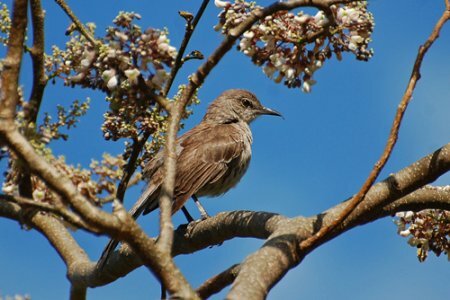 First stop was at Pine-tree Park in Miami-Dade where a rare Bahama Mockingbird had been seen regularly in recent days. As predicted, it was easily located and quite oblivious of the activity around it. This bird, my second Bahama Mockingbird in the last month, is quite drab compared to the one I saw at Key West, and has a malformed upper mandible. We drove on north to see if we could get a better look at some more Purple Swamphens. 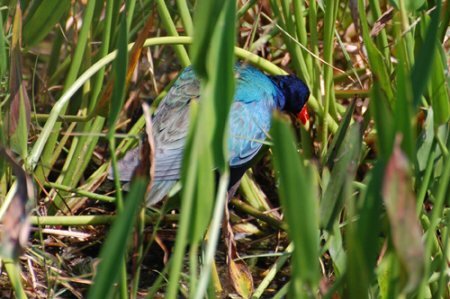 We stopped at the City Furniture Pond near Tamarac in Broward County and were soon rewarded with not one, but two Purple Gallinules, including this one foraging in the reeds. Mission accomplished, I returned home to plan my next foray. I will divert a bit from my primary objective of finding Code 2 birds, in order to try to see the Buff-collared Nightjars (Code 3) recently seen in Arizona [with another attempt at Sinaloa Wren (a Code 5), this time in Huachuca Canyon rather than the one seen earlier this year in Tubac], from whence I will go up to Washington to try again for a Sooty Grouse, (one of my now remaining 8 Code 2 birds) this time looking in the Hurricane Ridge area. From age 65 on to my present age of 80 I have taken up the hobby of birding on a serious basis, although birds have always been of interest to me. When I became serious I went back and checked off about 400 species that I had identified in my “youth”. I then decided to strive for a life list of 500 birds. Well, that has long been surpassed during my birding efforts over the last 15 or so years, and a few years ago I said to myself, if I ever get to 725 I will be satisfied. Today I did (see # 725), but of course, I am not (satisfied). The North American Rare Bird Alert system (NARBA) has reported on two different Garganeys being seen in widely separated parts of the country: Vermont and Wisconsin. National Geographic’s Field Guide to the Birds of North America (Third Edition) describes this duck as “an Old World species; a regular migrant on the western Aleutians; very rare on the Pribilofs and in Pacific states, and “casual” elsewhere in North America”. My dog-eared, tattered and heavily annotated companion in the field is the National Geographic Third Edition Guide, referenced above, now outdated. I also maintain a cross-check at home, The National Audubon Society sponsored Sibley Guide to Birds. National Geographic purports to include (1) all species known to breed in North America-defined as the land extending northward from the northern border of Mexico, plus adjacent islands and seas within about two hundred miles of the coast; (2) species that breed elsewhere but are seen here when they spend the winter here or pass through on regular migration routes; and (3), accidental visitors seen here only when they wander off course or are blown in by storms if they have been seen at least 3 times in the past two decades or five times in the century (plus a very few that are expected to meet that standard). Sibley’s Guide, published in 2000, is more selective, including, generally, species that occur regularly within the area including most rare but regular visitors, i.e., loosely defined as those species recorded 10 or more times in the last 25 years. That is probably more information than most readers want, but it is prefatory to my identification today of my 40th North American duck: the Wisconsin based Garganey, hanging out with some Blue-winged Teal two miles north of the Crex Meadows Wildlife Visitors’ Center, along Wisconsin County Road F.
Sibley shows only 39 duck species in his work; National Geographic shows 45. Both contain the Garganey, an ABA Code 3 bird. So, I hereby claim a sweep of the Sibley ducks, and number 40 on National Geographic’s list of 45. My missing 5 include two species that I have never seen anywhere: Smew and Baikal Teal (neither of which Sibley mentions); and 3 that I have seen in far away countries but never in North America: Common Pochard, Spot-billed Duck and White-winged Pintail, (none of which Sibley mentions). The 6th duck omitted by Sibley but which I have seen in North America is the Falcated Duck that I saw in California and reported on in one of my prior blogs. Barbara had to stay home and mow the lawn today, taking advantage of our one dry day in weeks, so I don’t have any photos of my Garganey to grace this blog. Anyone interested can Google “Garganey” and see what a distinctive bird the male of the species is.